One. "Be your own kind of Beautiful!" Two. You don't have to spend a fortune to feel or look beautiful. Ahh, the good ol' days. Missing you, A. Simpson. Anyways, as I started getting more and more into makeup I found some of my favorite brands and favorite products in which were all affordable. 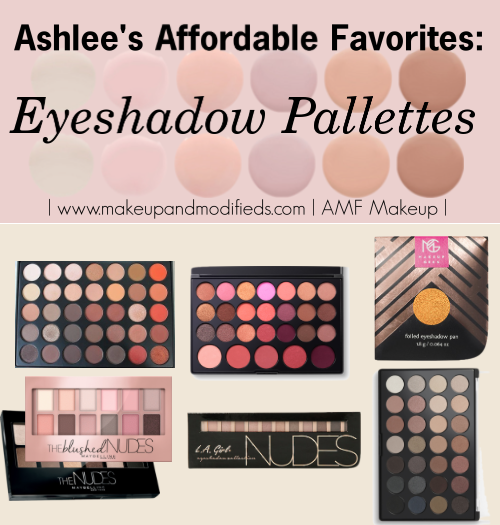 So today, I'm sharing with you all "Ashlee Affordable Favorites" so that you too can fall in love with the art of buying affordable but great quality makeup. Starting with Eye Shadow Palettes. Xo, Enjoy! I hands down think MorpheBrushes take the cake when it comes to eyeshadows. I have never found such a versatile company that has amazing formulations, brushes, and product pigmentation as MB does. I first heard of Morphe one a Jaclyn Hill Youtube Binge Day - so you know, like every day because JH is QUEEN - and of course I jumped at the first opportunity I got to go online shopping crazy. My favorite palette is the 35o Palette, which is constantly sold out because of how in demand it is, if you like warm tones than this is the palette for you. Fun Fact: Morphe is coming out with a ALL MATTE 35o Palette and I'm going to die of happiness. Can we take a moment just to thank the MG Queen herself, Marlena? From her foiled eyeshadows to her matte shadows...Girlfriend knows some great formulations. These babies are creamy! silky smooth! pigmented! AFFORDABLE! and just like morphe, you can by them in singles or in palettes. which I love. So if you aren't comfortable with knowing EXACTLY what shades you love to work with, I'd recommend purchasing them in a palette first. MG recently came out with contour and highlight powders too - who is ready for some face sculpting? ME ME ME!!! Thanks Marlena for answering our prayers!!! Ain't no brand in the industry have my like BH does. My first affordable brand love - my ride or die homie. Seriously, I could just do a whole post, heck I could write a book, about BH Cosmetics. I have more BH products than anything other brand because they are just that good. I use BH brushes in every single youtube video, every single day doing my makeup, and on clients. I love them. They also have such a wide variety of eyeshadows: shimmers. mattes. baked. You name it and BH has it. Their eyeshadows are some of my absolute favorites! AND they ALWAYS have sales going on. ALWAYS! Honestly, when I first grabbed the original Maybelline "The Nudes" palette, I wasn't impressed. And than "The Blushed" palette came out and I loved it. So I decided to try out the nudes again and I love them. They remind me a lot of the Naked palettes by Urban Decay - which is what they are a dupe for anyways - success! If you are looking for great dupes of UD's Naked Palettes then I would totally recommend reaching for the maybelline palettes. They are really stepping up their came in the eyeshadow world. Any Lip product by LA girl - I'm a fan. So I was excited to try their eyeshadow palettes to see if I liked them just as much. And I do. They also remind me a lot of the Urban Decay Naked Palettes. They are pigmented and easy to blend out which I love. And, they are affordable and accessible which is a HUGE plus for me. So if you're in the market for new palettes I would definitely look at LA Girl.